"The music of Lucid Duo has a lot of energy and sensitivity and it will make an impression on the audience. They show great promise for the future." Lucid duo is the first prize winning laureate of the prestigious Universal Marimba Competition 2011 in Belgium under the Patronage of Her Majesty Queen Paola, praised for their amazing degree of sensitivity to sound. Among others they were also recognized as Prizewinners of the Fidelio Chamber Music Competition 2015 in Vienna and finalists of the Contemporary chamber music competition De Linkprijs 2012 in The Netherlands. Their success brought them to international festivals and events in Austria, Belgium, Croatia, The Netherlands, Switzerland, Spain, Poland and their first appearance in Asia, giving a masterclass and concert at the renowned Kunitachi College of Music, Tokyo in 2016. In 2016 the duo specialized at the Toho Gakuen School of Music in Tokyo with the primary figure in the development of the marimba and Lucid’s biggest inspiration and idol – the Japanese legend Keiko Abe. The ensemble was formed in 2009 by Irena Manolova (Bulgaria) and Tomasz Golinski (Poland) in Belgium. After graduating Europe´ s first Marimba Master Degree at the Royal Conservatory of Antwerp, the duo believes in bringing the instrument to a further development as a solo concert musical instrument. Lucid’s performance is an introduction to the wide spectrum of the marimba virtuosity. Irena and Tomasz want to share their vision about this unique instrument and convince the audience to perceive it as a standard classical instrument. They mainly perform with a technical proficiency and above all passion and excitement a repertoire with selections of classical masterworks, own compositions and arrangements in a variety of musical styles. Seeking technical challenges and pushing the limits of the instrument has led Irena and Tomasz to unite two forces as they both have a strong background as soloists. Since Tomasz is one of the leading composers of his generation, the duo premieres many of his new works. These new compositions are being performed further by other marimbists around the world. In this unique way, the duo contributes to the marimba duo repertoire. 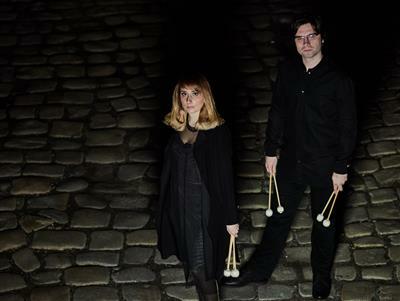 Lucid Duo is currently based in Vienna, Austria and is an Innovative Percussion Endorser.